We have a somewhat different CRUISE NEWS this month covering a recent trip on Celebrity Eclipse by editor-in-chief Malcolm Ginsberg across the Atlantic and along the eastern seaboard of the United States. Just pen pictures, nothing more. That is all that can be accomplished with very short visits. Cruising will also appear in the last issue of the year 18 December. Please also read NOVEMBER CRUISE NEWS, written on the way into New York. Just to add some ‘reflections’ on the crossing (no puns intended – it’s also the name of a sister ship). We were particularly impressed with the artwork around the ship. And the real lawn high up over the stern, available for what you might call ‘grassroot’ activities. Strange to think a lawn mower being sent aboard a ship as a maintenance item. 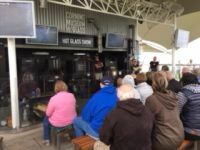 Nearby was the Corning glass show, with furnace and the finished articles. Interesting, but I can’t see where it fits into a cruise ship. A food outlet by the lawn would be better, perhaps ice cream. Best eating found, by far, was the Murano restaurant. Book early if you want to try. And we stand by our comments regarding lack of stateroom storage space, although the bathroom was over endowed. Also one must note the facilities offered for dialysis users on board certain cruises, including this one. The cost need not be exorbitant, with the UK NHS helping out by covering the charges that would be expected if the patient required the help at a British hospital. Well done Celebrity. The following micro-reviews are intended to give a flavour of the places visited. They are listed in cruise order. Each one of them is worth a week’s visit, and all can be reached by non-stop flights from Heathrow. Boston is Massachusetts’ capital and largest city. Founded in 1630, it is one of the oldest in the United States. 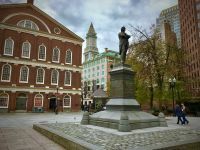 The key role it played in the American Revolution is highlighted on the Freedom Trail, a 2.5-mile walking route of historic sites that tells the story of the nation’s founding. One stop is Bunker Hill, which, while technically a British victory, proved that Colonial forces could fight effectively against the Crown. On offer was a pay-as-you-go shuttle to Quincy Market dating back to the 1820s, in the heart of the city and the starting point for the Freedom Trail. It is a National Historic Landmark. Plenty of restaurants, shops, stalls and street entertainment. One can walk into town. It is about two miles, crossing a bridge and viewing the waterfront. As ever, the best way to see things on a short stay is a hop-on hop-off tour, electric trolleys supplying the service in what is still America’s Irish capital. Do get off at Boston Common and have a stroll around the 50 acres of public gardens. In the winter, the frog pond becomes a skating rink. Also on the ride is the Cheers bar, the original, Fenway Park for baseball fans and Harvard, which is in Cambridge (Massachusetts). Find time for the USS Constitution in the Charlestown Navy Yard. As an alternative, you can take in the Boston connections to American presidents, John and John Quincy Adams and John F. Kennedy. Less than nine hours is not enough time to see a fascinating city. Rather than the normal early-morning arrival at New York, we were treated to a mid-afternoon trip up the Hudson towards Pier 90, the traditional berthing of the Atlantic liners in the days before mass air travel. Pity it was a really grey day. Having cleared customs and immigration at Boston, getting off was very easy into a revitalised passenger terminal, simple, neat and working well. We purchased a CityPass giving access to a number of famous New York landmarks including the iconic Empire State Building, the Statue of Liberty, various art museums and, moored at the next quay, USS Intrepid and, with it, Concorde. 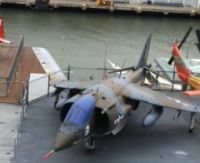 Sadly, to our way of thinking, the flight deck of Intrepid has become cluttered with ‘add-on exhibits’, including the Space Shuttle Pavilion. While the line-up of aircraft is outstanding, one cannot get the real feel of what a ‘flat top’ is all about. Opposite, the city tour buses waited. Check carefully what you are buying, as some tickets are just for the day and some 24hr. And they are not cheap. We took the alternative Big Bus from the nearby ferry terminal, which turned out to be very good, with conductors on board actually describing the route bang up to date, rather than a preloaded system that can go wrong when you get diverted. We changed buses in the central area and took one that passed by Central Park to Grants Tomb on the Hudson, through Harlem and then down past the east side of the park, stopping at the Metropolitan Museum of Art. If it is the 9/11 Memorial and Wall Street area that you want, best to use the New York subway. It is quick and cheap. Times Square and the night life of New York are only a short taxi ride away. The recommendation is cab one way and walk back downhill, unless at night. 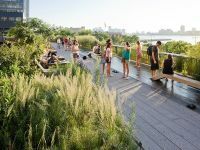 Also nearby is the High Line, a 1.45 mile linear park created on a former high-level rail track from 34th street into the trendy rejuvenated Chelsea area. One day at sea and it was into the Royal Naval Dockyard, the berthing place for large ships visiting the British Overseas Territory of Bermuda. The nearest point of land is the USA, 600 miles to the west, the island sitting all alone 6.5hr from Gatwick and 2.5hr from Kennedy. Directly south nearly 1,000 miles away is Puerto Rico. The island has a distinctive blend of British and American culture, but driving is on the left and the Bermuda dollar is pegged to the US version. Bermuda’s economy is based on its offshore financial facilities and tourism. The population is just 65,000 and the temperature rarely drops below 20c or rises above 32c. Earlier this year, the island hosted the America’s Cup. The British have never won since it was inaugurated in 1851. We did no better this time around, hence little media coverage in the UK. Eclipse docked on time at 10:30 for a 25hr stay. Nominal immigration and straight into the dockyard area with taxis lined up and public transport to take you virtually anywhere on the island, uniquely by either bus or water taxi. You buy one pass to cover everything, but it is for the day and not 24hr. We chose first to go to Hamilton, the picturesque capital and then on to the town of George's, a UNESCO World Heritage site, which includes a church that was never finished. It seems the parishioners had a disagreement and abandoned the location. It is now a tourist attraction and is said to be more expensive to keep in its present state than to complete. King's Square includes the 18th-century town hall and nearby the Tucker House Museum is a typical home from the 1700s, with displays of crystal, silver and period furniture. Other notable landmarks include St Peter's Church, founded in 1612. It was then a 45min water taxi ride back. A courtesy shuttle was on hand to take us to the Clocktower shopping mall, once a Royal Navy warehouse. Next morning a quick dip in the sea at the dockyard (in November and OK for one who does not like cold water) from the little (spotless) beach in the complex. Then into the National Museum of Bermuda, and the outstanding Commissioner’s House, built in the 1820s, the world’s first prefabricated cast-iron residential building. It is the home for a number of exhibitions on three floors. Within the compound is a dolphin pool and also various military buildings now turned into very effective display complexes. With the ships docking next door, there is also a play area. For Celebrity, it was a rare visit. Bermuda saw 100 ship visits this year. In 2018 Celebrity Summit is a regular from RCCL’s New Jersey terminal close to Newark Airport New Jersey. If it is central New York that suits Norwegian Cruise Line offers a weekly package in the summer that includes the return flights from London to JFK, seven nights on Breakaway, a ship especially designed for the market. The cruise includes a sea day to start and finish, three nights moored at the Royal Naval Dockyard, and as much time as you want at New York. It makes for a great fortnight’s holiday. Or you can fly non-stop to Bermuda on British Airways. Bermuda is on the bucket list for a return. Everywhere and everything is so close, from golf to snorkelling with nightlife thrown in. One day at sea and then to the port city of Nassau on the island of New Providence, Bahamas. Eclipse and four other big ships were in, perhaps 10,000 people getting on and off including crew. It all seemed to work well with little hassle and the two gangways always busy. Officially known as the Commonwealth of the Bahamas, with the Queen as head of state, the Bamahas consists of more than 700 islands, cays and islets in the Atlantic Ocean. It extends for 590 miles, has a population of around 350,000 and consists of about 30 inhabited islands linked by air and water transport. Grand Bahama is 54 miles off the coast from West Beach, Florida, and to the south Cuba only 60 miles from some of the islands. Just like Bermuda, the economy is based on it being an offshore tax location and tourism. With even less time than Bermuda, the visit was rushed and too short for a first-time visitor. Be wary of Americans who insist on renting left-hand drive cars but must also drive on the left. First stop Graycliff, a private Italian-owned mansion just outside the centre of the city, a 20-room elegant boutique hotel with a variety of restaurants and function rooms. Graycliff has hosted the Duke of Windsor (formerly King Edward VIII) and the duchess, Lord Mountbatten and Sir Winston Churchill. Currently under further redevelopment, it offers the only 5-star fine dining establishment on the islands. There is a 25m swimming pool in the beautifully laid out gardens. The Baha Mar is the ultimate playground for adults, a resort which is about to take off, dominated by the 1,800-room Grand Hyatt. There is a 100,000sq ft casino, the largest in the Caribbean, and restaurants galore. 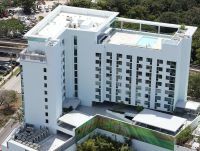 Last week, the SLS Baha Mar joined the complex, and with only 299 rooms considered “cool”. Next year, 284 private residences are due to be completed. In fact, it all nearly did not happen with the ground-breaking taking place in February 2011 and the whole project gaining Chapter 11 bankruptcy in 2015 and the financing reorganised. Chinese money is supporting the venture. An 18-hole Jack Nicklaus Signature Golf Course with clubhouse and island views adjoins the property. 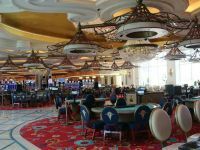 Baha Mar could be seen to be in direct competition with the long-established Paradise Island, whose past investors have included Donald Trump and South African hotel magnate Sol Kerzner. Baha Mar on first impressions seems much more upmarket than the Paradise Island complex just outside Nassau, the final venue on our whistle-stop tour. Called Atlantis, the venue needs a week at least to scratch the surface of what is on offer. It caters for all ages and tastes, and bank balances, hosting a 60,000sq ft casino, 750 slot machines open 24hr, six hotels and 3,600 rooms of varying styles of accommodation. For the youngsters, there is entertainment galore and one water-themed activity after another, and shopaholics will find all that they need in the Crystal Court and Marina. And whatever the size of your private yacht, a mooring can be found. Definitely somewhere to come back to. Port Miami welcomed 4.8m passengers last year, making it the busiest cruise port in the world. With Port Everglade, Fort Lauderdale, now well into 3m, it needs to keep on its toes and is doing so. Miami does try to welcome you these days. It seems to be a rejuvenated city working hard to emphasise multiculturalism. Once landside, getting one’s luggage was a real struggle – no airport-style trolleys for the mostly over-60s passengers and not enough porters. The taxi rank was well organised. But given the choice, choose a cab whose driver’s first language is English. Not for us for a one-night stop Miami Beach. This glamorous neighbourhood is famed for its colourful art deco buildings, white sand, surfside hotels and trendsetting nightclubs. Our hotel was the 12-month old Atton Brickell hotel in the centre of the financial district. A 4-star 275-room property, it offers a 12th-floor rooftop bar and swimming pool, large rooms and a walk-in shower. Breakfast is currently being included in a promotional package, not the norm for an American hotel. On the Sunday night we stayed, there was a film under the stars. Adjoining is the last thing one would expect to see in Miami, a 7.8-acre nature reserve and the home to 15 endangered plant species. It really is a quiet oasis, the canopy now recovering from Hurricane Ima. 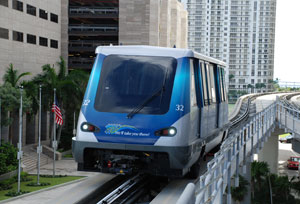 Just two blocks away is the local Metromover station, the penultimate stop on the light rail system, which is free to everyone. Nearby is Mary Bicknell village for eating and at the 8th Street station there is a fine new shopping mall. This Miami version of the DLT runs through downtown Miami as far north as an area called School Board. Here, we found the Pérez Art Museum, the building opened in 2013. 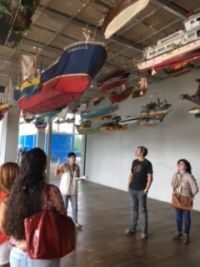 The focus of the museum is 20th-century and contemporary art, as well as cultures of the Atlantic Rim, which it defines as the Americas, Western Europe and Africa. It is a sort of American version of the Tate Modern. In February 2014, a local Floridian artist, Máximo Caminero, destroyed a million-dollar coloured vase by a Chinese artist in protest at the Pérez' lack of displays by locals. Caminero was subsequently arrested and charged with criminal mischief. He pleaded guilty and was sentenced to 18 months on probation and 100hr of community service and banned from visiting the museum during this period. After the visit it was straight into the adjoining Verde luncheon place, recommended. Guests sitting outside on the terrace have a view overlooking the bay as well as the Port of Miami. Local produce when available the menu said, large plates and typical Spanish-American wholesome lunchtime food. Excellent friendly service, with the manager coming over when he heard our accents. But why the 18% add-on charge after the sales tax had been applied?